HAS THE SUMMER HEAT BEEN TOUGH ON YOUR HAIR? DOES YOUR HAIR NOT STYLE AS WELL AS IT USE TO? HAS IT BEEN A LONG TIME SINCE YOU HAVE TRIMMED YOUR ENDS? 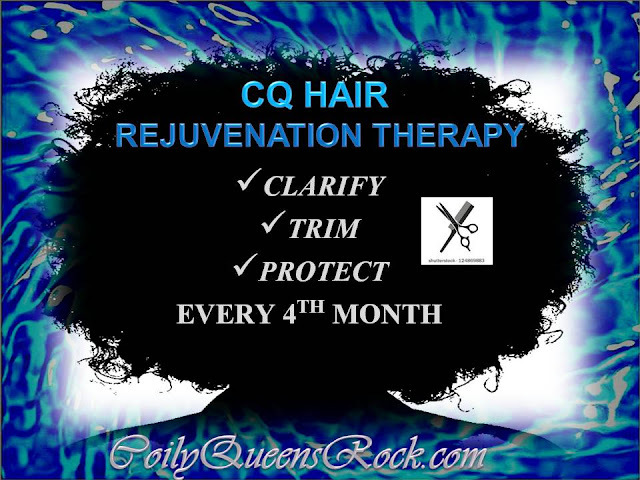 If you have answered yes to any of these questions, then it is time for CoilyQueens Hair Rejuvenation Therapy. TIME TO REVIVE YOUR HAIR!!! 1. CLARIFY: It is very beneficial to clarify the hair of all product. We all need a deep cleanse every now and then. We love showers but every now and then you want to sit in the tub for a nice deep soak and cleanse. Well think of your hair in the same way. Clarifying will remove any hard to remove product. This will enable your deep conditioners and products to work better. Your protein treatments stick to the hair better. You will find that your hair styles better after a deep cleansing. Enhance your cleansers with 1 tablespoon of ACV to the amount of shampoo you plan to use. DO NOT CLARIFY WITH BAKING SODA EVER! BAKING SODA IS ABRASIVE AND DAMAGING TO THE HAIR CUTICLE! 2. TRIM: Trim at least 1/2 inch or more off of your ends. The ends are the oldest part of your hair. Your ends will looks better and grow better if you keep a regular trim schedule. Styling and manipulation leaves the ends frayed and sometimes they split. Regular trims help to combat the manipulation and old ends. First clarify your hair with one of the recommended cleansers. Cleanse using the two lather shampoo process. Two strand twist the hair in medium sections. Find your thin frayed ends on each twist, trim those with cutting shears for the hair. Take your time this process is really simple. Now your hair is deep cleansed, strengthened, conditioned and trimmed. You should notice that your hair styles much better. Your hair has more sheen, softness, strength and life. Mark your calendar and repeat again in 4 months. Wow. I did this even before reading this post. Glad to be on the right track. Thank for all your help. Thank you so much for the info. It was very very helpful!